These new earrings made by me feature gorgeous Murano glass beads! 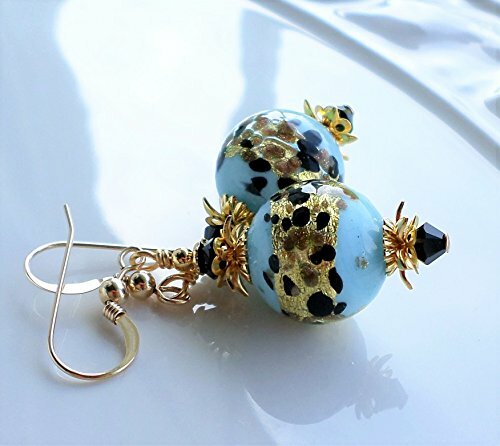 The round shaped 14 mm beads are done in a pretty Light Aqua Blue glass, that is decorated with a band consisting of genuine 24 KT gold foil and bits of Black Moretti glass in a cool leopard print pattern! The accents included are Swarovski Crystals combined with bright gold plated brass and 14 KT GOLD FILLED french ear wires. Total length: 2 inches.